Earlier this week, after almost exactly 30 months of legislative wrangling, the EU Member States approved the final compromise of the Directive on Copyright in the Digital Single Market. It’s the same text that was approved by the European Parliament at the end of March. This means that the Directive will become law as soon as it is published in the Official Journal of the European Union. Judged against our own ideas about a modern EU copyright framework that facilitates access to cultural and information, strengthens user rights and reduces unnecessary copyright infringement, the outcome of EU copyright reform process is a big disappointment. The directive expands the scope of copyright and instead of harmonising copyright rules across the EU member states, it contains measures that will further fragment and complicate the EU copyright framework. Instead of strengthening public interest exceptions to copyright, the directive relies on voluntary licensing by rightholders, giving them the ability to block users’ access. As a result the final directive does not live up to the “Digital Single Market” label that it carries in its title. The adopted text does very little to harmonise an already complex set of rules among the Member States. Instead, the directive creates additional rules to the system that have been designed to further the (perceived) interests for specific classes of rightholders—most notably the music industry and press publishers. Once the directive has been implemented in the Member States, the EU copyright system will likely be more complex, and thus more difficult and costly to navigate for users and European businesses. In this regard the provisions of Article 17 (formerly Article 13) remain the most problematic in the entire directive. The article is a legislative monstrosity that will most likely achieve the opposite of what it was intended to accomplish. Instead of establishing clear rules that require commercial content sharing platforms to adequately remunerate the creators of the works that they distribute, it will impose substantial regulatory burdens and create legal uncertainties for years to come. The most likely benefactors of this outcome will be large rightholders and the incumbent dominant platforms. The existing intermediaries within the creative value chain will have the means to navigate the uncertainties and conclude complex licensing arrangements, but users and independent creators at the edges of these value chains will suffer the consequences: They will be presented with fewer distribution platforms to choose from, and they will have less freedom of creative expression. With the directive formally adopted by both the Parliament and Council, the fight for a better EU copyright enters into a new phase. The EU Member States will soon have two years to implement the rules established by the directive into their national copyright laws. While such implementations will have to include all the problematic aspects of the directive, there is some room for meaningful improvements, and some measures can be taken to mitigate the worst provisions of the directive. Today, after a 30-month long legislative procedure, the European Parliament voted on the Directive on Copyright in the Digital Single Market. Members of the Parliament approved the Directive, with 348 voting in favor and 274 voting against, and 36 abstaining. The Directive is the most important European regulation of the digital sphere in the last several years. It will define the shape of copyright in Europe for years to come — and have spillover effects for regulation around the globe. We believe that the approved directive will not meet the goal of providing a modern framework that balances the interests of rightsholder and users, protects human rights and enables creativity and innovation to flourish. Instead, it is a biased regulation that supports one business sector, at the cost of European citizens. In the last two and a half years, and especially since last June, we faced an extremely heated debate and intense legislative process. During this time, together with a broad coalition of activists, experts and organisations, we attempted to remove (or improve) its most controversial parts. In the last weeks, we supported an effort to amend the directive during the plenary, in a last attempt to remove the most detrimental provision — Article 13. Unfortunately, the European Parliament rejected a motion to vote on amendments to the Directive, with 312 MEPs voting in favor, and 317 voting against. This motion would have opened the door to remove Article 13 but keep the rest of the directive intact. It failed. The Directive was therefore approved, with all the controversial elements that we have been criticising: content filters introduced by Article 13, new rights for publishers introduced by Article 11, and a mechanism for overriding copyright exceptions for education by private agreements introduced by Article 4/2. European parliamentarians, together with the Commission and the governments of the Member States have given a strong signal of support to the entertainment industries and their incumbent players — at a dire cost to internet users and freedom of expression. We believe that it is an unbalanced approach that will have severe repercussions. These legal provisions will not only cost millions to small and medium sized European platforms, but most importantly put fundamental freedoms at risk and set dangerous precedents for user rights. Earlier today, on the eve of tomorrow’s vote, we distributed 750 copies a journal titled “Say YES to copyright and NO to Article 13” to the offices of the MEPs in Strasbourg. This is part of a last ditch effort by civil society organisations to prevent MEPs from approving a new copyright directive that includes the disastrous Article 13. You can download our journal here (pdf) and we are re-publishing the text of the editorial below. Article 13 of the proposed Copyright Directive will put even more control over European culture and knowledge into the hands of online monopolies. As organisations representing digital creators and knowledge workers, we urge you to reject this provision that will replace the rule of law with proprietary algorithms controlled by big tech companies. It is high time that Europe adapts its copyright framework to meet the needs of the digital age. The proposed directive contains many measures that take steps in the right direction, such as improving the negotiation position of authors and performers, better safeguarding the public domain, and by allowing researchers and cultural heritage institutions to make better use the opportunities created by the digital environment. In spite of widespread opposition from academics, internet users and millions of concerned citizens, the directive still contains provisions that will force most internet platforms to filter all content uploaded by their users to remove any copyrighted works flagged by rightsholders. This will cost European companies and new startups millions, and what’s worse, it won’t work. The idea that technology can reliably differentiate between legitimate and unauthorised uses of copyrighted material has been credibly disputed by experts across the spectrum. Putting the regulation of speech and creative expression in the hands of private corporations lacks public support. Instead of taking the right step toward a Digital Single Market that works for all, a directive that includes Article 13 would sow even more legal uncertainties. Instead of empowering European creators, it will entrench the position of dominant platforms. Instead of balancing fundamental rights, it will weaken the law by shifting power towards algorithms and away from crucial users’ rights upholding freedom of expression. We support the objective to ensure that creators are rewarded adequately for their creativity. Upload filters themselves will not achieve this objective. This directive needs to take the interests of all stakeholders into account, not only “big tech” and “big content”. Copyright should be a matter of social contract that upholds the public interest, not of secret algorithms controlled by private actors. We therefore ask you to reject the text of the directive as long as it includes Article 13. Days before the final vote of the European Parliament on the copyright directive, the discussion about the directive seems entirely focussed on Article 13. A wide coalition of civil society groups, online creators, academics and citizens is calling for the removal of Article 13 from the directive. On the other side 270 organisations representing rightsholders are calling on MEPs to say “yes to copyright” and pass the directive in its current form (including Article 13). (1) Nobody really wants to see the widespread use of upload filters and (2) Everybody agrees that there is a need to ensure that creators are fairly rewarded on the basis of licenses obtained by the online platforms. This agreement is emerging as a result of several recent developments. On the side of the opponents of Article 13 the intense discussion of the previous weeks has resurfaced the fact that underneath the calls for a deletion of Article 13 there is widespread acknowledgement that there is a real need for platforms to pay those creators who want to be paid for uses of their works by the platforms. On the side of the proponents of Article 13 there seems to be an increasing realisation that an Article 13 that does require widespread use of upload filters may lack sufficient support within the EP (and certainly outside of it). The final vote on copyright reform in the plenary session of the Parliament is scheduled for March 26. After more than 30 months of work on this topic our overall assessment remains unchanged: The proposed Directive is bad, and will not make the internet work for people. The final “compromise” text has done nothing to accommodate the concerns we and others have raised over the past 2+ years. As long as Article 13 remains part of the package, the only sensible way forward it to make sure that Directive will be rejected by the European Parliament. There is still time to act! Read along to find out what you can do in the last days before the vote. Since last year we have tracked the development of Article 13 of the proposed Directive on Copyright in the Digital Single Market by publishing a series of flowcharts that illustrates its internal logic (or absence thereof). Now that there is a final compromise version of the directive we have taken another look at the inner workings of the article. The final version of Article 13 continues to be so problematic that as long as it remains part of the overall package, the directive as a whole will do more harm than good. This is recognised by an increasing number of MEPs who are pledging that they will vote against Article 13 at the final plenary vote. The flowchart below illustrates the main operative elements of Article 13. These include the definition of the affected services, the types of services that are explicitly excluded from its scope (the green box in the top right corner) and the reversal of the liability rules for the services covered by Article 13. It further details the obligations imposed on the services. 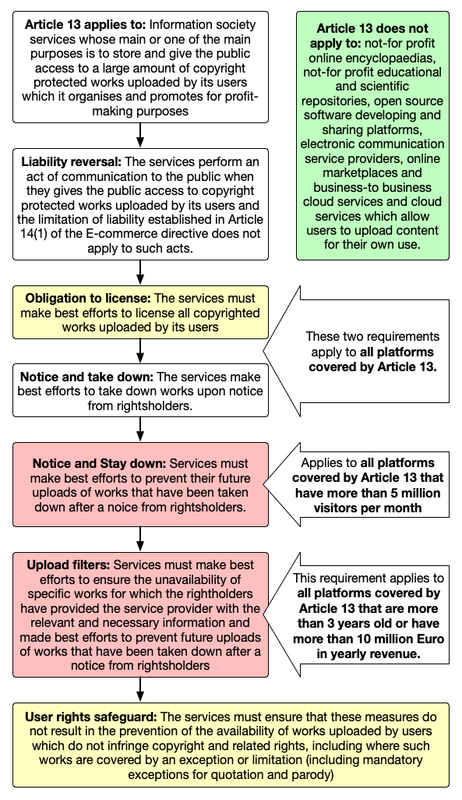 These include an obligation to seek licenses for all copyrighted works uploaded by users (the yellow box) and the requirements to ensure the unavailability of certain works that will force platforms to implement upload filters (the two red boxes). 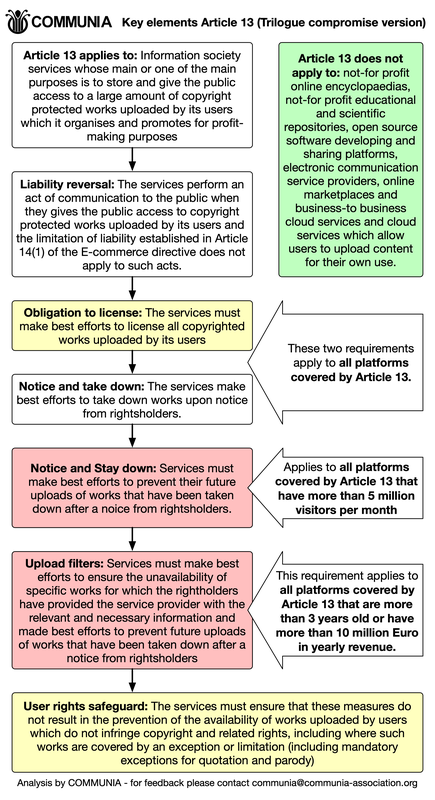 The yellow box at the bottom contains the measures that platforms must take to ensure that the upload filters don’t negatively affect users’ rights. After 30 months, EU legislators agree to sell out users and creators to big platforms and big content. After yesterday’s agreement between the European Parliament, the Council and the European Commission on a compromise text, the EU copyright reform process has entered into its final phase. The good news is that after yesterday’s compromise the text cannot get any worse: it will either be adopted or it will be rejected. The bad news is that the text that was agreed on yesterday is **the worst version that we have seen yet**. After three days of negotiations, the negotiators have agreed on a text that would benefit big corporate rightsholders, Google and other dominant platforms at the expense of users, creators and the rest of the European internet economy. To understand what has happened during the negotiations, it is illustrative to look at the differences between the final compromise and the text that had been agreed among the EU member states last week (which was the result of horse trading between the French and German governments). Yesterday’s compromise text is largely in line with the French-German deal. This includes a terrible version of Article 13 that will severely limit users ability to express themselves online. It will also further consolidate the power of dominant platforms, as smaller platforms will struggle with implementing expensive filtering technology and supporting the increased costs for dealing with increased liability. It also introduces a EU-wide neighbouring right for press publishers that will have very similar effects. It benefits dominant platforms who can afford compliance while creating additional costs and risks for smaller players. As a result, users will likely end up with less access to information and the diversity of information available online will likely suffer. Under these conditions it remains to be seen if rightsholders will indeed manage to extract more value from the large intermediaries. Today will see the third of the “final” trilogue meetings this week. Soon we will either have a final text of the copyright directive (and we are assuming it will be either bad or very bad), or it’ll be dead in the water. At this moment the fate of the directive largely hinges on the ability of the negotiations to find a compromise on Article 13. The negotiations this week rely on the mandate obtained by the Romanian presidency last Friday. This text, based on a compromise hashed out between France and Germany, has been widely characterized as the worst version of Article 13 yet. While negotiators have been working on finding a final compromise this week, we have analysed the current text proposed by the presidency and created a flowchart of what’s in play. In its current version Article 13 now has nine operative provisions — now exceeding the number of articles the 2001 InfoSoc directive required to describe both the rights granted under copyright and the exceptions and limitations to those rights! Ahead of today’s discussion of a new copyright mandate in the Council, which would pave the way for a final trilogue at the beginning next week, the situation is becoming increasingly messy. Over the last 24 hours various groups of rightsholders ( Europe’s biggest entertainment company , a number of smaller associations from the Audiovisual sector and an unprecedented coalition of big AV holders and half of the music industry ) have come out against the proposed directive as a whole and Article 13 in particular. With the defection of major music industry organisations from the pro-article 13 movement, the once-united front of rightsholders in favour of Article 13 seems to have completely disintegrated. This makes it clear that the EU copyright reform process has been hijacked by the legacy entertainment industry in an ill-conceived attempt to re-establish their control over the distribution of cultural goods. Under these conditions it starts looking increasingly unlikely that the copyright directive will be adopted before the EU elections later this year.